As pet owners, we have a soft spot for all creature big and small. We also understand that sometimes it can be hard to find a bed suitable for our furry companion! Whether you have a little terror who chews everything, or a giant horse dog, we have something for you. We use high quality fabric even your dog will have trouble chewing through! If chewing isn’t your problem however size is we can create beds for even the largest of animal, call us today for more information! Helping as many animals as we can! 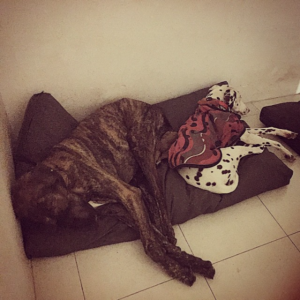 Dog beds Perth is something we hold dear to our heart here at Sew Covered, although we are a Perth upholstery company we like to stick our noses into helping those that need it the most. We have created a little charity to give animals that are looking for homes a warm bed to sleep or some food in belly. For every custom dog bed created we donate 25% to the animal shelters and rescue homes throughout Western Australia.